Heat olive oil on medium-high heat in a large skillet. Season chicken breast with salt and pepper. Start cooking the fettuccine noodles according to the directions on the box. When there are only 2 minutes left in the cooking time, add the broccoli to the boiling noodles. Add minced garlic to the skillet and allow to cook for 1-2 minutes, or until lightly browned, on medium heat. Add heavy cream and butter and bring to boil. Turn heat to low and add Parmesan cheese and stir till it completely melts. Your broccoli and noodles should be done now, drain completely. 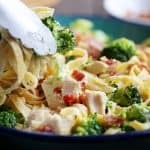 Add cooked pasta and broccoli to the skillet (still on low heat) with alfredo sauce. Use tongs to stir and coat all the noodles. Season with salt and pepper to taste.